The bird might be rare elsewhere, but in recent years it seemed to be doing quite well in Ghana, where it was seen commonly in landfill sites, food markets, urban dumpsters and around slaughterhouses. In Ghana’s capital city, Accra, flocks of five hundred vultures might be seen. Then, at least according to anecdotal evidence, Hooded Vultures started rapidly decreasing in number. Francis Gbogbo of the University of Ghana, Japheth Roberts of the Ghana Wildlife Society, and Vincent Awotwe-Pratt of the Conservation Alliance saw the need for a critical examination of the Hooded Vulture’s abundance in its urban stronghold in Ghana, and an investigation of its principle sources of mortality. The study was conducted in Accra. From just 377,000 residents in 1960, the human population of the city has grown to as many as 4,000,000 in the greater metropolitan area. Weekly counts of Hooded Vultures were made on the Legon Campus of the University of Ghana. As many as 220 vultures were seen between November 2010 and January 2011, but this number plummeted to just five individuals in 2015 and 2016. The numbers seemed to represent an actual decline, and not just a relocation. Some of the decline in vulture numbers may have been a result of competition with Pied Crows which increase in number on the university campus over the same period. The introduction of covered waste bins on campus may also have decreased the opportunity for scavenging by vultures. Similarly, in an attempt to decrease the risk of collisions between airplanes and vultures, efforts were made to decrease the attractiveness of the region around Kotoka International Airport. For instance, refuse dumps in the area were closed or covered. The recent closure of unhygienic slaughterhouses in Accra likely also had an affect on Hooded Vulture numbers. 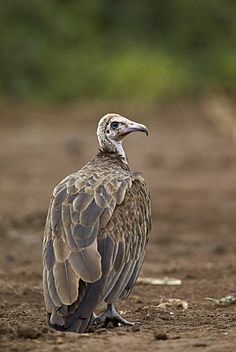 The researchers examined the published literature for details of the vulture’s abundance. Gbogbo et al. also spoke with vulture researchers, as well as those who had experience with the habitats frequented by Hooded Vultures, including waste managers, scrap dealers and refuse scavengers. It seems that the capture and sale of Hooded Vulture carcasses for use in traditional medicines and black magic is not insubstantial. The researchers found that the value of the head of a vulture in a market in Tamale was 200 Ghana cedis. That is about two-months’ wages for a middle-income earner in Ghana. Many dead vultures and vulture parts are apparently exported to Nigeria. Some vultures are being captured and sold as food, sometimes to an unsuspecting public. Gbogbo, F., J. S. T. Roberts and V. Awotwe-Pratt. 2016. Some important observations on the populations of Hooded Vultures Necrosyrtes monachus in urban Ghana.